We are excited to release the first phase of custom question lists for alpha testing. Check out Custom question lists: finding questions you can answer for a refresher on the feature. A reminder that the functionality being released is a new experience for selecting the question lists and new filter/sort controls. The ability to save and reuse "custom lists" comes in phase II. 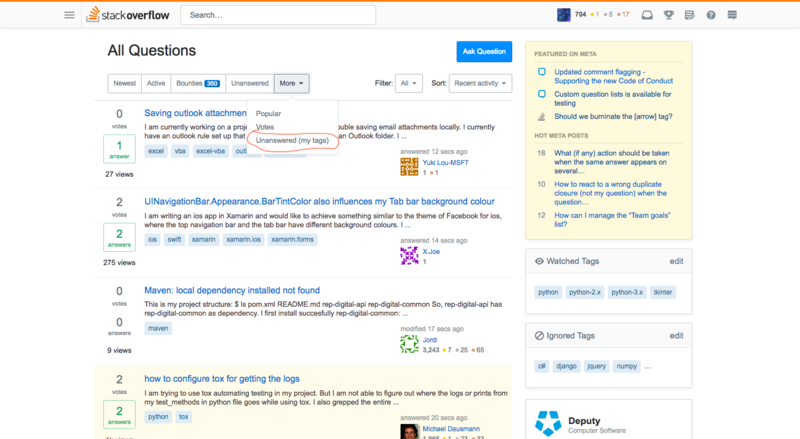 Note: This functionality is being released on Stack Overflow, Meta Stack Overflow and Meta Stack Exchange. Once it is out of alpha, it will be available on all network sites. note: set it once and the feature (when active) will be available on SO, MSO, MSE. You won't be immediately opted in. At first your status will be "Pending". We are limiting the number of people who have access. This will let us find/fix issues with less disruption. And, it will let us manage the load that this new feature puts on the servers (this could be more of an issue in phase II). When you do get access to the feature, please try it out. Log bugs as answers on this post. Scroll to the bottom and click the button for another page 2. You'll either get a 404 page or the message that there are no questions found, while the 'bounties' tab is again selected. 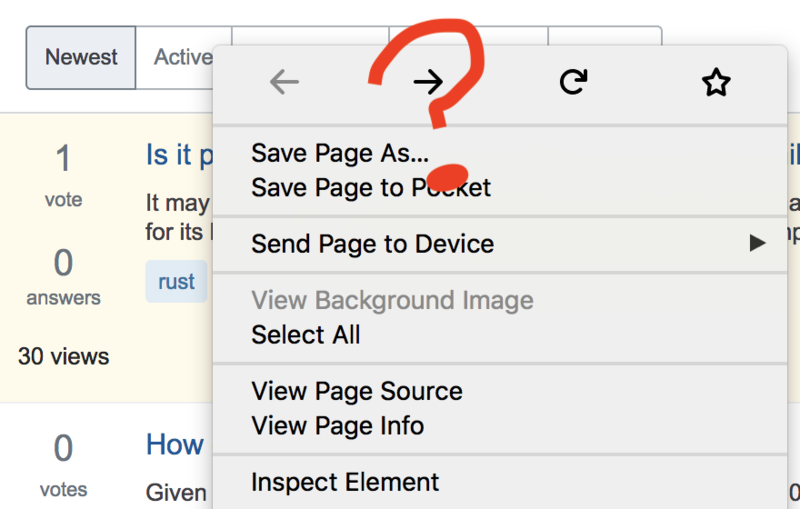 Once the menu is opened, if I click elsewhere (without changing anything), the page refreshes. This is a bit irritating. I might just want to see what options I have set, but as soon as I open the menu it is bound to refresh the page as it closes. Please consider giving an "Ok" button to confirm changes (and refresh the page), or a "Cancel" button to discard changes (without refreshing pages) or both. 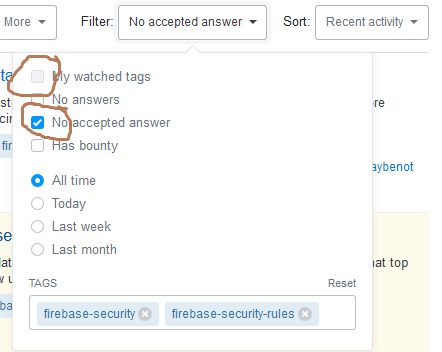 What is the point of the "no answers" and "no accepted answers" filter options? I think it is so that we can find questions that we'd like to answer. But if that's the case, why are closed questions not filtered out? If there's some other purpose to those options, I'd be happy to hear it. 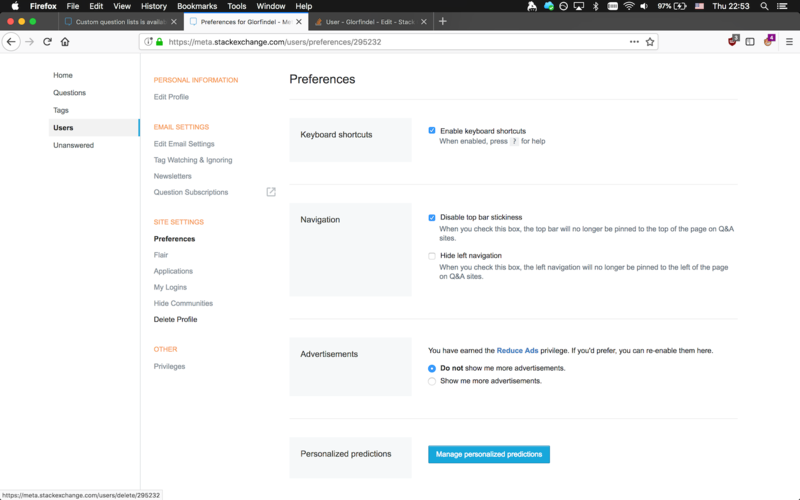 But otherwise, it seems to me that we need to (1) automatically filter out closed questions when choosing the "no answers" or "no accepted answers" options, and/or (2) add a "closed" checkbox to the filter dropdown. I realize that we'll be able to do fancy custom search strings in Phase II, but it seems like a tool meant to help people find questions to answer should have the built-in ability to easily hide closed questions. I successfully tried using some filters and got the posts displayed (for example: my tags, no answers, no accepted, today). I then proceed to press next, to see the rest of the target questions, but when I do the filters are reset. How can I see the next page of questions that meet my filters? Edit: Looking closer, I see that although the filters are gone and now there are many more questions, they are still ordered according to the filters I gave it. It's like we appended the rest of the questions at the end of those original 28 pages returned. 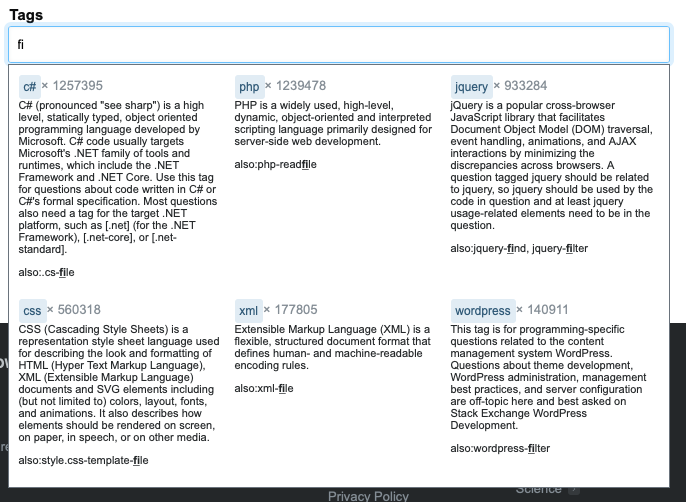 Still, the filters on the interface are "reset", although the tag(s) description on top of the filters remains displayed. Indicate whether filter option "today" means "created today" or "last active today" – perhaps in a tooltip. In search, according to help, there are two available time parameters: created and lastactive. It's not immediately clear which of these two parameters is used in the question lists feature. If it's not convenient to display this all the time, at least stick it in a tooltip that appears when hovering over "today," "last week," and "last month." I see this is the case for all 3 test sites. Is this behavior intended? At first I was confused as I was "Active" but didn't see the changes, until I pressed Questions is that I saw the layout change. 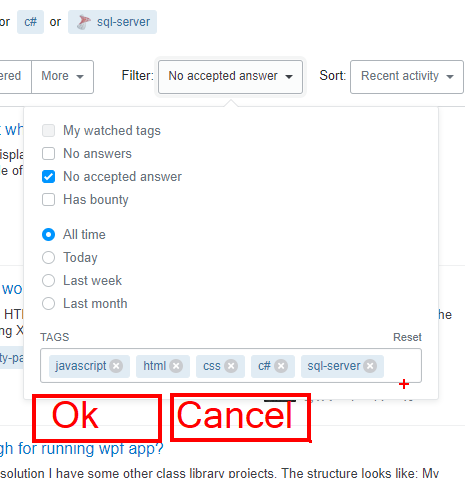 I can't find the Custom Question Lists option, neither here nor on Meta Stack Overflow (but on Stack Overflow, it works now). I have set the filter to display only the questions that don't have an accepted answer. Yet, occasionally I do see questions that have an accepted answer. The form doesn't handle large numbers of tags very well. The input field won't resize enough and it does not scroll. The "see more linked questions…" link when there are more than 10 linked posts results in a "Oops! Something Bad Happened!" error. This does not occur if I open it in incognito, therefore I'm suspecting that the new custom lists is the culprit. 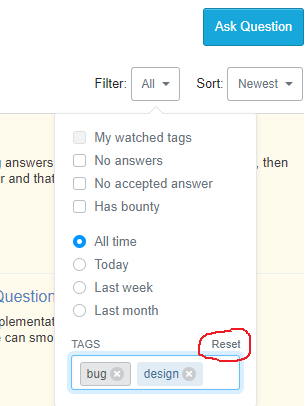 The Reset option in the Filter: TAGS is not functioning, if you are adding some tags and click the Reset. But if you are change the Radio button option and click the Reset it will clear the tags. I have verified the issue in the recent Google Chrome and Mozilla Firefox browsers. 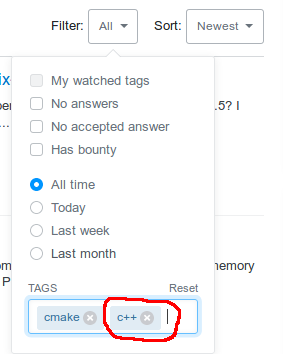 Why is the My watched tags disabled (when any tag is entered) while the other checkboxes act like actual checkboxes? I have a feeling that this is a bug, rather than a feature. 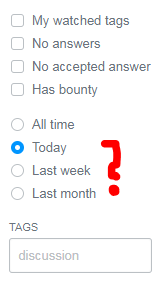 When I try to find the bounties which are will be end today, by Filter: Has Bounty, Today and Sort: Bounty ending soon. It returns No questions found. Since there are many bounties are ending today, which I can verify manually. 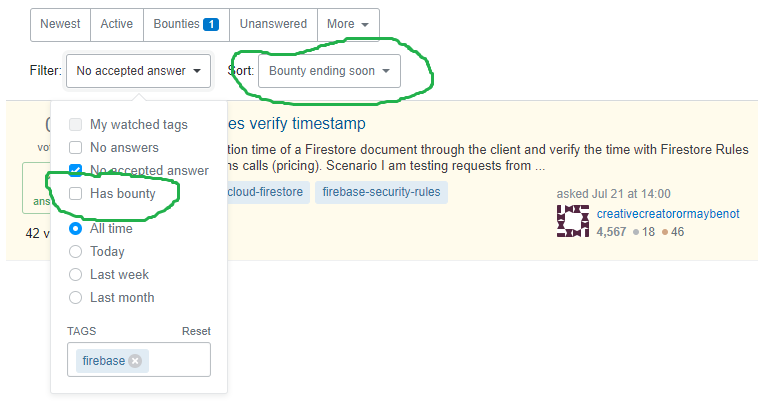 If you use "Bounty ending soon" sort option the results will be filtered as if the "Has bounty" was checked. Even if you didn't check it. Tested on both SO and MSE, both on the questions page and on a tag page. Strangely, on MSE, when filtered on a single tag, the tab popular does return different results, but presumably not the intended results. For example, on The review tag page, I only get 2 questions (1, 2). On SO I just get the same result as the newest tab. "Looking for more featured questions? Browse the complete list." 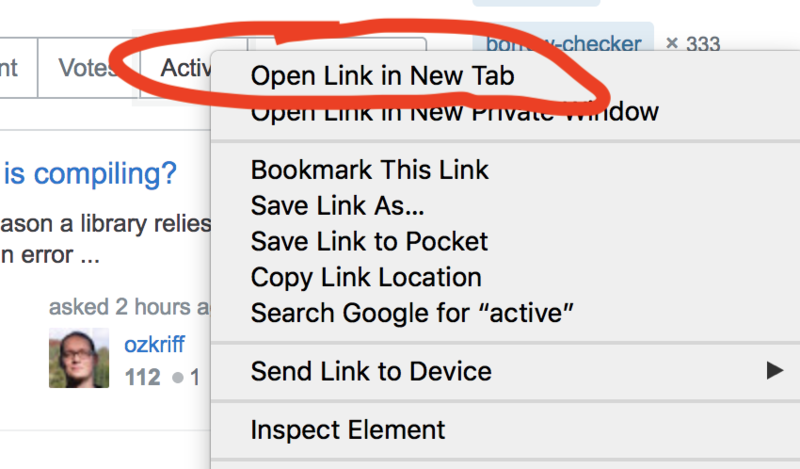 link displayed at the bottom of the Featured tab on Home no longer works. 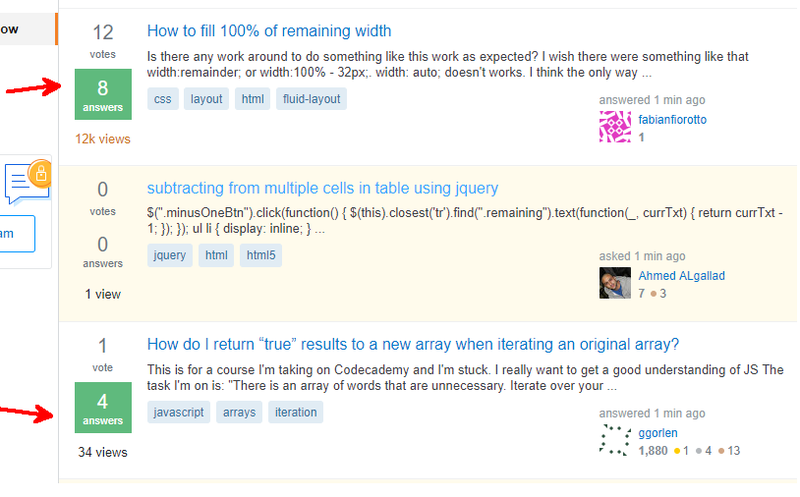 To reproduce, ensure that the last tab you viewed in /questions is not the Featured tab. 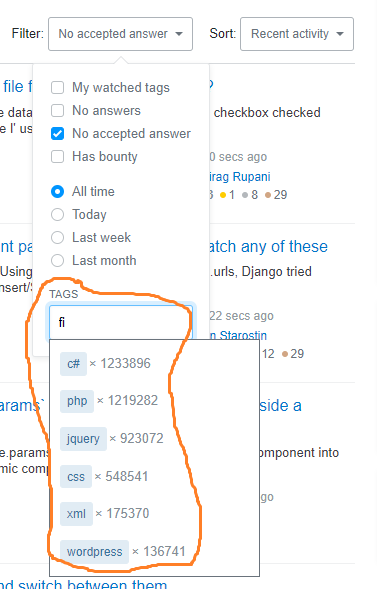 Clicking the "complete list" link seems to just bring you to the /questions page with whatever tab you were last on, not the featured list that might be expected from the text. 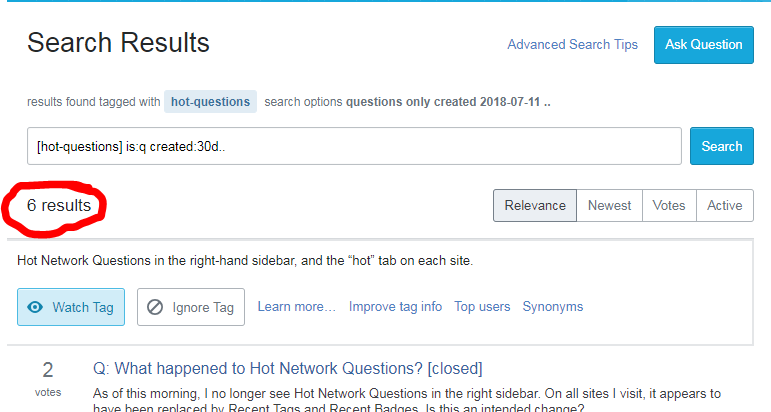 Similarly, the "complete list of questions" link at the bottom of most of the other Home tabs doesn't work as described, but just uses whatever tab you were last on. 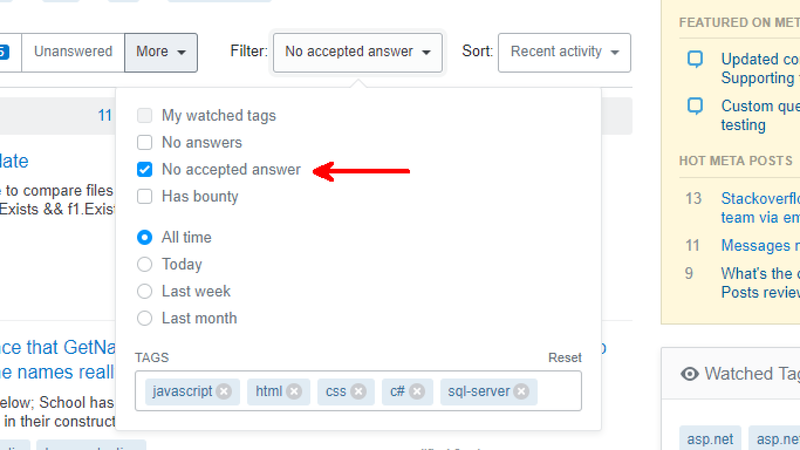 When I'm on the bounties tab stackoverflow.com/TAG?tab=Bounties the filter is on "has bounty" and the sort is on "bounty ending soon". When I uncheck the has bounty filter I'd expect the sort to revert to newest or recent activity, now it keeps on bounty ending soon and therefore no results are displayed. Not the answer you're looking for? Browse other questions tagged discussion question-lists custom-question-lists . Why do I see tags that I don't watch? Should bug-report/feature-request *questions* that duplicate Grab-bag *answers* be closed as duplicates? Is there an overview of questions for my subscribed sites with all my watched tags?